Residents Grant and Gaye Gunderson, part of the group of town residents who were waiting for the anti-federal, anti-FBI protesters at the courthouse in Harney County. Anti-government protesters face off with a group of locals in Burns, Ore., who want them to go home. Burns resident Leon Pielstick carries a sign outside the Harney County Courthouse on Monday. Here's what led up to the scene: A week ago, the FBI made its move against the leaders of the occupation, arresting them out on a stretch of lonely highway. During that operation, law enforcement shot and killed a militant named LaVoy Finicum, causing outrage among sympathizers all across the West. So they started flocking to Burns to show their displeasure with the FBI. They planned a big rally outside the courthouse, but when they got there, they came up against a wall of local people. "Go home! Go home! Go home!" the locals chanted. It wasn't the reception Barbara Berg expected. She is an anti-government protester from Nevada, who until this moment believed most of the community supported the militants. "I ... want to know how many of them live here, how many are paid actors," Berg says. The self-styled "patriot" groups regrouped and got out their bullhorn. "We are all Americans! We're all Americans here!" shouted B.J. Soper, one of the leaders of a group called the Pacific Patriots Network. He tried to explain to the locals that his organization just wants to rein in an overly aggressive government. 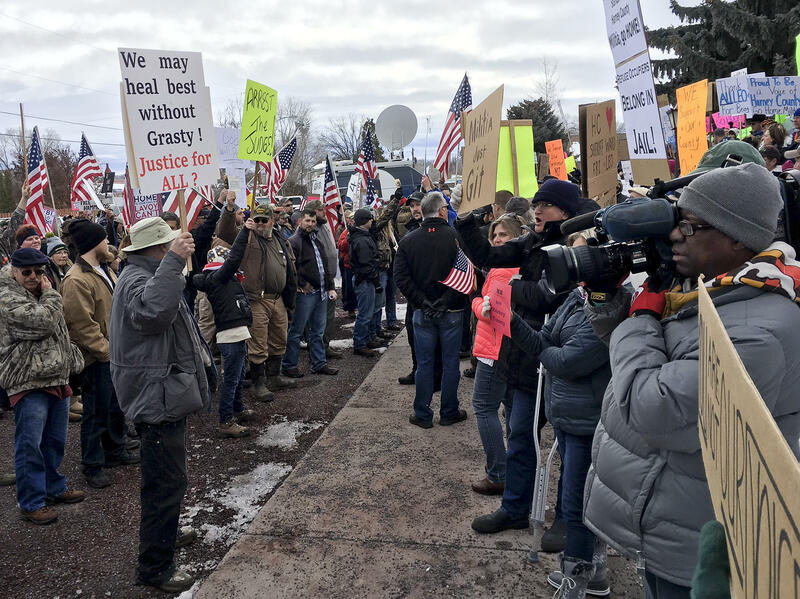 "We want your community and the people accountable for the death of LaVoy Finicum held accountable because they are as guilty as the FBI that pulled the trigger!" Now, people in Burns agree with a lot of what these groups have to say. 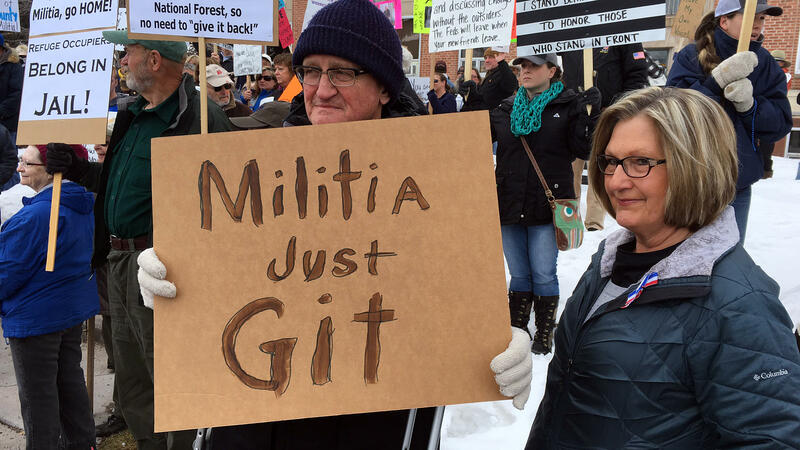 Locals are tired of the heavy police and FBI presence since the takeover at the refuge, and most people here do think the federal government overreaches, especially when it comes to environmental rules and land use. But they're also sick of outsiders hanging around, trying to start a movement. "I don't know who to wave to anymore," says local resident Nancy Fine. "You have to kind of look and say, 'Is that a friend or is that someone who doesn't belong or doesn't live here and has come here to make trouble?' "
Fine says one sure way of identifying an outsider is a prominently displayed sidearm. She shoots a scornful glance at a trio of men standing in front of her, their arms crossed, their holsters hanging out. "We all have guns but none of us wear them on our hip and kind of flaunt them around. We consider that extremely rude and ungentlemanly at best," Fine says. To many here, flaunted guns represent a deeper shift. There's always been tension over the role of the federal government, just as in the rest of the rural West. But the tensions didn't seem extreme. In fact, locals thought they had made progress, hammering out compromises with federal agencies. But now there's a harder edge to things, according to Leon Pielstick. "I was having kind of a heated discussion with a good friend of mine. We had to stop and get back on ... the same footing because you can't have those kind of arguments. You can't be tearing the community apart," Pielstick says. 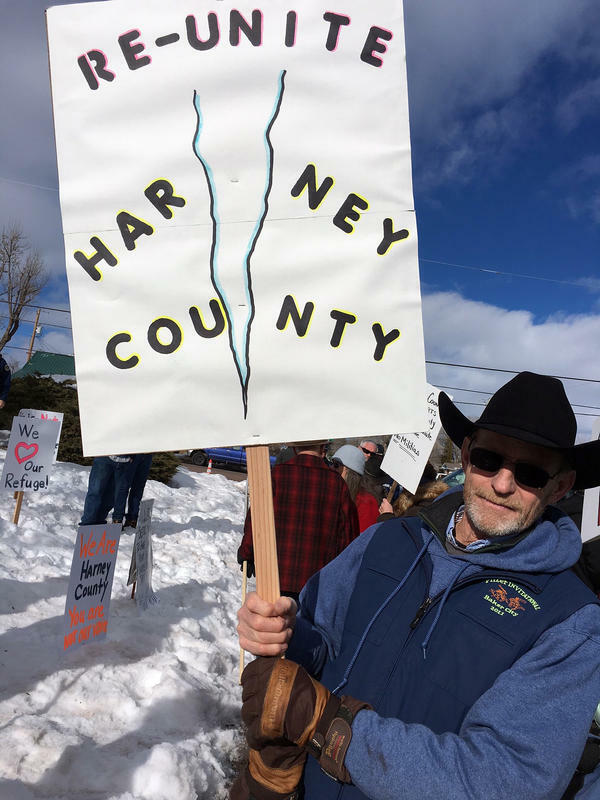 Pielstick carries a sign that says "Re-Unite Harney County." Two women nearby aren't sure that's possible anymore. One says the community has been flooded in "testosterone," as she puts it, and the other, Donna Clark, says the effects of that will linger. "We need the outside people to go home so we can start to heal. It's going to be a long, hard process," Clark says. It's been a month since armed militants took over the headquarters of the Malheur National Wildlife Refuge in Oregon. The occupation is now down to just four people fenced in by law-enforcement checkpoints. It feels like the endgame, but that hasn't done much to get rid of the stress it's causing people who live nearby. NPR's Martin Kaste reports that stress erupted yesterday in the form of a huge shouting match on the steps of the county courthouse. MARTIN KASTE, BYLINE: Burns, Ore., is a small town - about 2,700 people. So it's not every day that you see 400 or 500 people out on the streets, screaming at each other. KASTE: Here's what led up to this scene. A week ago, the FBI made its move against the leaders of the occupation, arresting them out on a stretch of lonely highway. During that operation, law enforcement shot and killed a militant name LaVoy Finicum, causing outrage among sympathizers all across the West. So they started flocking to Burns to show their displeasure with the FBI. They planned a big rally outside the courthouse, but when they got there, they came up against a wall of local people. UNIDENTIFIED CROWD: (Chanting) Go home. Go home. Go home. KASTE: It wasn't the reception that Barbara Berg expected. She's an anti-government protester from Nevada who, until this moment, believed that most of the community supported the militants. BARBARA BERG: Yeah. I hadn't - this is, you know - this is the first I've seen. But I also want to know how many of them live here, how many of them are paid actors. KASTE: The self-styled patriot groups regrouped and got out their bullhorn. B.J. SOPER: We're all Americans. SOPER: We are all Americans here, OK? KASTE: That's B.J. Soper, one of the leaders of a group called the Pacific Patriots Network. He tried to explain to the locals that his organization just wants to rein in an overly aggressive government. SOPER: We want your community and the people accountable for the death of LaVoy Finicum held accountable because they are as guilty as the FBI that pulled the trigger. KASTE: Now, it should be pointed out here that people in Burns agree with a lot of what the patriot groups have to say. Locals are tired of the heavy police and FBI presence here since the takeover at the refuge, and most people here do think the federal government overreaches, especially when it comes to environmental rules and land use. But they're also sick of outsiders hanging around trying to start a movement. NANCY FINE: I don't know who to wave to anymore. KASTE: That's focal resident Nancy Fine. FINE: You have to kind of look and say, well, is that a friend, or is that a - someone who doesn't belong here, doesn't live here and has come here to make trouble? KASTE: Fine says one sure way of identifying an outside is a prominently displayed sidearm. She shoots a scornful glance at a trio of men standing in front of her, their arms crossed, their holsters hanging out. FINE: We all have guns, but none of us wear them on our hip and kind of flaunt them around. We consider that extremely rude and ungentlemanly and best. KASTE: To many here, flaunted guns represent a deeper shift. There's always been tension here over the role of the federal government, just as in the rest of the rural West, but the tensions didn't seem extreme. In fact, locals thought they'd made some progress hammering out compromises with federal agencies. But now there's a harder edge to things, according to Leon Pielstick. LEON PIELSTICK: I was having a - you know, a - kind of a heated discussion with a good friend of mine. Well, we had to stop and get back on - you know, somewhere on the same footing 'cause you can't have the kind of arguments. We can't be tearing the community apart. KASTE: Pielstick is carrying a sign that says reunite Harney County. But nearby, two women say they're not sure that's possible anymore. One of them says the community has been flooded in testosterone, as she puts it, and the other, Donna Clark, says the effects of that will linger. UNIDENTIFIED WOMAN: And outside go home. UNIDENTIFIED WOMAN: And you know what? UNIDENTIFIED WOMAN: ...You know? We've had enough of it. CLARK: And it's going to be a long, hard process. KASTE: Martin Kaste, NPR News, Burns, Ore. Transcript provided by NPR, Copyright NPR.